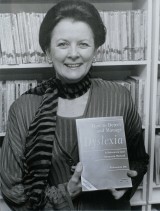 Philomena Ott is internationally recognised for her expertise in teaching pupils with dyslexia and as an author for clarifying jargon and complex research. She has lectured and disseminated the experience gained from her Churchill Travelling Fellowship in 11 countries. "During the 1980s there was an explosion of interest but a lack of information about Special Education Needs. There was much personal suffering and people's lives were disrupted through lack of recognition, understanding and the availability of specialist teaching. Cries for help came from parents, professionals and adults who underfunctioned because of literacy problems. A resource manual to provide practical advice was needed. The challenge was to produce a text that was readable, practical and had elements of self-help. The suggestions and recommendations needed to be substantiated by the current research findings and examples of the best teaching methods available. To access this I applied for, and was awarded, a prestigious Churchill Travelling Fellowship to study 'the latest techniques in the diagnosis and teaching of dyslexics' at the world-renowned Scottish Rite Hospital in Dallas. This had a life-changing impact on my knowledge and understanding of the condition. My Churchill Fellowship has been a lasting and pervasive influence on my teaching. It has helped me address the needs of children and adults with dyslexia, and advanced understanding of what was once a hidden handicap, now recognised in government Disability legislation. It has helped raise the profile of dyslexia through media coverage, including live radio and TV interviews, as well as features in the national and international press. I have published four books, and written chapters in other books as well as articles in journals and magazines." "I sincerely hope this book will encourage not only people of today, but also of tomorrow, to be more understanding of the problems that currently exist with dyslexia." "The challenge . . . is to identify the signs of dyslexia before it blights confidence. This book offers practical advice . . . it provides sensible answers . . . from real-life experience and based on up-to-date international research." "One in five children and adults in the country find spelling difficult. This is a book which deserves a welcome."